Crowds gathered at the new Martin Luther King Jr. Memorial in Washington on Monday. 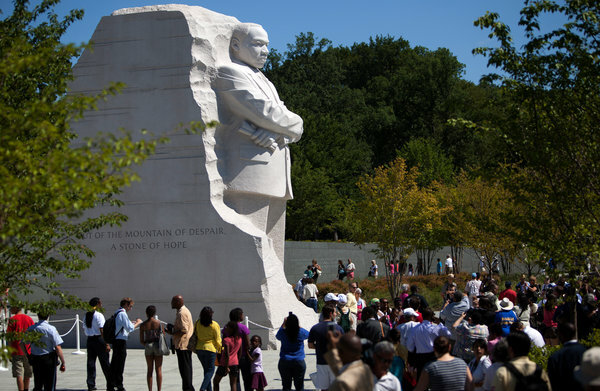 WASHINGTON — After more than two decades of planning, fund-raising and construction, the Martin Luther King Jr. Memorial — a four-acre slice of the National Mall featuring a granite statue of Dr. King — has officially opened to the public. The memorial will be formally dedicated on Sunday in a ceremony that is expected to draw as many as a few hundred thousand people from around the country. But some of its earliest judges came on Monday, as hundreds of city residents and visitors stood in line for their turn to take a look. The dedication, which is to include remarks by President Obama, coincides with the 48th anniversary of the March on Washington and Dr. King’s “I Have a Dream” speech, delivered at the Lincoln Memorial. The memorial is the first on the National Mall to honor an African-American, said Harry E. Johnson Sr., the president of the foundation in charge of erecting it, and that made it an emotional occasion for many who came to see it. In 1996, Congress authorized the memorial’s establishment on the Mall, and Alpha Phi Alpha, an African-American fraternity, set up a foundation to accomplish that. A Chinese sculptor, Lei Yixin, was selected to create the 30-foot sculpture, and an architect, Ed Jackson Jr., designed the layout, which includes a bookstore, a wall with Dr. King’s quotations and nearly 200 cherry trees. The cost was $120 million, and organizers said they are still trying to raise the last $5 million. The design gave form to a line from Dr. King’s “Dream” speech — “With this faith we will be able to hew out of the mountain of despair a stone of hope,” said Mr. Jackson. In the memorial, he explained, Dr. King is seen emerging from the stone of hope. The two towering mounds set slightly behind him, forming a sort of passageway to the statue, are mountains of despair. Some visitors said they did not like the fact that Dr. King was facing the Jefferson Memorial, not the Lincoln Memorial, as it is on a rough diagonal between the two, but Mr. McNeil said he did not mind. “The only thing I don’t like is that I have to wait until 11 a.m. to get in,” he said. During a press briefing on Monday, Mr. Johnson chose to emphasize Dr. King’s focus on poverty and justice, steering away from questions about race. It was more a gesture of hope, he said, than a tactic of avoiding an inevitably difficult conversation. For Mr. Wilson, race is still very much present, but he did not expect the monument to do much to change that. Reprinted from The New York Times, National, of Monday, August 22, 2011.